The flu impacts millions of people throughout each year. This illness comes on rapidly, often showing symptoms within hours after exposure to the virus, and can last for up to two weeks, or sometimes even more for those who are particularly vulnerable. If you are a family caregiver, you are likely to encounter a time when your elderly parent will experience this sickness and you will need to care for them. This is an important role, making a major difference in how they are able to get through their recovery and move forward. While you are caring for your parent, it is extremely important to remember your own vulnerability to illness. 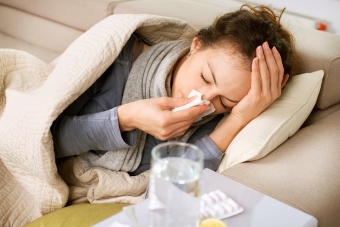 The flu is highly contagious, and it is possible to catch more than one strain of the sickness during the same season. Taking steps to protect your own health while caring for a senior with the flu is vital to guarding your own well-being, and to preventing the spread of this sickness among others. Consider wearing a medical mask when caring for your parent to reduce risk of breathing in germs. If you fulfill care tasks for your senior that involve coming into physical contact with them, wear disposable gloves. Wash your hands regularly throughout the day, even after wearing gloves. Encourage your parent to wash their hands throughout the day. Make sure your parent uses and disposes of tissues when coughing or sneezing. Use sanitizing wipes to clean surfaces that comes into contact with anything that might be germy, including tissues or hands. Talk to your doctor about increasing your resistance with extra vitamin C.
If you start to feel under the weather, do not hesitate to go to the doctor. They may be able to give you an antiviral medication that reduces the duration and intensity of the sickness, and helps to reduce the chances you will experience a serious complication. Respite elder care can be an exceptional resource when you are caring for an elderly adult. A respite elder home care services provider can be with your aging parent on a temporary or urgent basis to ensure they have access to all the care and support they need when you are unable to care for them. This can be extremely valuable when you or other members of your family have gotten ill and you do not want to spread these germs to your parent, or when you need time to rest. This can also be valuable when you simply need time away from your care efforts for a break, to participate in an activity, or manage other tasks. This elder care provider will follow your senior's schedule and routine as much as possible to help them stay healthy, comfortable, and safe, and support quality of life.